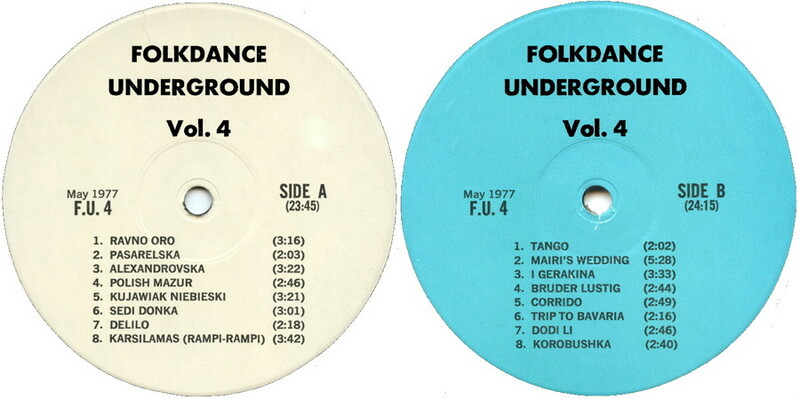 Folkdance Underground was a non-profit non-organization dedicated to the people who dance. All the dances on these albums had shown some degree of popularity among folk dance circles, but due to their scarcity had lacked the momentum to become widespread favorites. 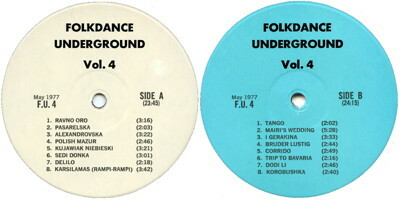 Folkdance Underground returns with thanks for the encouragement and comments received on our initial effort, while our first album was borne out of the need to combat overpricing and unscrupulous practices besieging the folkdance community, this album lends itself to still another problem, unavailability. Ten of the sixteen recordings on this LP have never been released on an American label. The others appeared briefly here but are now out of print. Ethnic recordings, unfortunately, stimulate insufficient public demand to warrant their production or licensing by major American labels who must make a profit to survive. All the dances on this album have shown some degree of popularity among folkdance circles, but due to their scarcity have lacked the momentum to become widespread favorites. In this respect, they may be likened to endangered species of animals, lacking the resources necessary for their continued propagation. It is our hope that this album will help in preserving this small but nonetheless valuable portion of our folkdance heritage from extinction. Our first offering, Narodno Oro, comes from Jugoton Records of Yugoslavia. It is a line dance written and performed by Pece Atanasovski and the Prate Ensemble. Le Bal de Jugon, a couple dance, and the circle dance Bannielou Lambaol, were originally released in 1960 by Disques Vogue of France. These songs are from the northwestern province of Brittany where Celtic is still spoken and strongly affects the dialect of the area. Bumps-a-Daisy is a square dance that makes you laugh, performed by the late Carson Robison  an early leader in the country music field. Originally released by MGM, this is not for those concerned with styling or looking proficient on the dance floor. The original source of Lakodalmi Tánc is unknown, but first appeared here on a now defunct recording from Crossroad Records of Seattle, produced by Hungarian dance authority Andor Czompo. Our three Norwegian couple dances are from 45s on the Harmoni label of Norway, performed by the dance ensemble of Rolf Myklebust. Vossarul features Sigbjorn Bernhoft Osa on hardingfiele  an eight string fiddle. All the Israeli songs presented here are a product of Hed-Arzi Records, a label truly committed to Israeli culture. Lach Yerushalayim, Sayenu, and Joshua were licensed briefly to choreographer Dani Dassa who released them here as 45s and did much to increase their popularity. All are currently available only on Israeli LP's. Somogyi Karikázó (Girl's Dance From Somogyi) is performed by the Girls Choir of the Bartok Ensemble, and is from a Qualiton album of Hungarian Folk Dances. Trei Păzește and Galoanul de la Bîrca, are line dances choreographed by Theodore Vasilescu and popularized in the United States by Sunni Bloland, a U.C. Berkeley instructor and foremost American authority on Romanian Dance. These are from a Dutch album, Romanian Folkdances II, on Nevofoon. F.U.2 ends with a wedish waltz, En Afton vid Mjorn (An Evening at Mjorn Lake), recorded in Stockholm by the Ojebo Chorus, from an out of print Capitol recording. We hope the original producers of these recordings will not take offense at the inclusion of their material here, but rather consider this album a promotional device to breathe new life into dying dances. Folkdance Underground is a non-profit non-organization dedicated to the people who dance. If you pay more than $2.00 for this album, you are being ripped off. Happy Dancing! Salty Dog Rag  U.S.A.